The purpose of privacy notices and choice mechanisms is to notify users of the data practices of a system, so they can make informed privacy decisions. This blog post was edited by Elonnai Hickok. The visual communication of a privacy notice is determined by the User Interface (UI) and User Experience (UX) design of that online platform. User experience design is broadly about creating the logical flow from one step to the next in any digital system, and user interface design ensures that each screen or page that the user interacts with has a consistent visual language and styling. This compliments the path created by the user experience designer. UI/UX design still follows the basic principles of visual communication where information is made understandable, usable and interesting with the use of elements such as colours, typography, scale, and spacing. UI/UX design builds upon user behaviour to anticipate their interaction with the platform. It has led to practices where the UI/UX design is directed at influencing the user to respond in a way that is desired by the system. For instance, the design of default options prompts users to allow the system to collect their data when the ‘Allow’ button is checked by default. Such practices where the interface design is used to push users in a particular direction are called “dark patterns”. These are tricks used in websites and apps that make users buy or sign up for things that they did not intend to. Dark patterns are often followed as UI/UX trends without the consequences on users being questioned. This has had implications on the design of privacy systems as well. Privacy notices are currently being designed to be invisible instead of drawing attention towards them. Moreover, most communication designers believe that privacy notices are beyond their scope of expertise. They do not consider themselves accountable for how a notice comes across to the user. Designers also believe that they have limited agency when it comes to designing privacy notices as most of the decisions have been already taken by the company or the service. They can play a major role in communicating privacy concerns at an interface level, but the issues of privacy are much deeper. Designers tend to find ways of informing the user without compromising the user experience, and in the process choose aesthetic decisions over informed consent. The ineffectiveness of privacy notices can be attributed to several broad issues such as the complex language and length, their timing, and location. 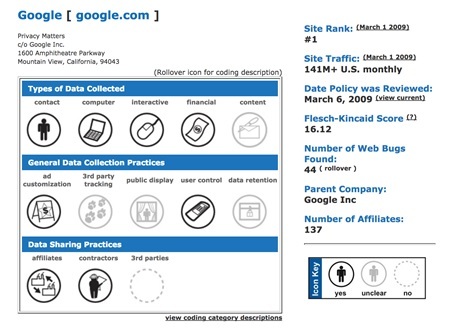 In 2015, the Center for Plain Language  published a privacy-policy analysis report  for TIME.com , evaluating internet-based companies’ privacy policies to determine how well they followed plain language guidelines. The report concluded that among the most popular companies, Google and Facebook had the more accessible notices, while Apple, Uber, and Twitter were ranked as less accessible. The timing of notices is also crucial in ensuring that it is read by the users. The primary task for the user is to avail the service being offered. The goals of security and privacy are valued but are only secondary in this process. Notices are presented at a time when they are seen as a barrier between the user and the service. People thus, choose to ignore the notices and move on to their primary task. Another concern is disassociated notices or notices which are presented on a separate website or manual. The added effort of going to an external website also gets in the way of the users which leads to them not reading the notice. While most of these issues can be dealt with at the strategic level of designing the notice, there are also specific visual communication design issues that are required to be addressed. Long spells of text with no visible structure or content organisation is the lowest form of privacy notices. These are the blocks of text where the information is flattened with no visual markers such as a section separator, or contrasting colour and typography to distinguish between the types of content. In such notices, the headings and subheadings are also not easy to locate and comprehend. For a user, the large block of text appears to be pointless and irrelevant, and they begin to dismiss or ignore it. Further, the amount of time it would take for the user to read the entire text and comprehend it successfully, is simply impractical, considering the number of websites they visit regularly. The front facing interface of an app or website is designed to be far more engaging than the privacy notice pages. There is a visible difference in the UI/UX design of the pages, almost as if the privacy notices were not designed at all. In case of Uber’s mobile app, the process of adding a destination, selecting the type of cab and confirming a ride has been made simple to do for any user. This interface has been thought through keeping in mind the users’ behaviour and needs. It allows for quick and efficient use of the service. As opposed to the process of buying into the service, the privacy notice on the app is complex and unclear. A pattern in the privacy notices of most companies is that they attempt to establish credibility and gain confidence by stating that they respect the users’ privacy. This can be seen in the introductory text of the privacy notices of Apple and LinkedIn. The underlying intent seems to be that since the company understands that the users’ privacy is important, the users can rely on them and not read the full notice. The text heavy notices need clear content pockets which can be navigated through easily using mechanisms such as menu bar. Navigability of a document allows for quick locating of sections, and moving between them. Several companies miss to follow this. 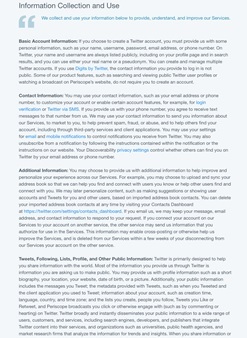 Apple and Twitter privacy notices (shown above), have low navigability as the reader has no prior indication of how many sections there are in the notice. The reader could have summarised the content based on the titles of the sections if it were available in a table of contents or a menu. Lack of a navigation system leads to endless scrolling to reach the end of the page. Facebook privacy notice, on the other hand is an example of good navigability. It uses typography and colour to build a clear structure of information that can be navigated through easily using the side menu. The menu doubles up as a table of contents for the reader. The side menu however, does not remain visible while scrolling down the page. This means while the user is reading through a section, they cannot switch to a different section from the menu directly. They will need to click on the ‘Return to top’ button and then select the section from the menu. The complexity of privacy notices has led to the advent of online tools and generators that create short notices or summaries for apps and websites to supplement the full text versions of policies. Most of these short notices use icons as a way of visually depicting the categories of data that is being collected and shared. iubenda , an online tool, generates policy notice summary and full text based on the inputs given by the client. It asks for the services offered by the site or app, and the type of data collection. Icons are used alongside the text headings to make the summary seem more ‘visual’ and hence more easily consumable. It makes the summary more inviting to read, but does not reduce the time for reading. 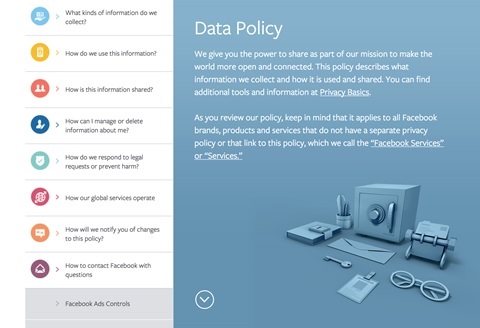 Another icon-based policy summary generator was created by KnowPrivacy. They developed a policy coding methodology by creating icon sets for types of data collected, general data practices, and data sharing. The use of icons in these short notices is more meaningful as they show which type of data is collected or not collected, shared or not shared at a glance without any text. This facilitates comparison between data practices of different apps. One of the more provocative initiatives is the Me and My Shadow ‘Lost in Small Print’  project. It shows the text for the privacy notices of companies like LinkedIn, Facebook, WhatsApp, etc. and then ‘reveals’ the data collection and use information that would closely affect the users. Issues with notices have also been addressed by standardising their format, so people can interpret the information faster. The Platform for Privacy Preferences Project (P3P)  was one of the initial efforts in enabling websites to share their privacy practices in a standard format. Similar to KnowPrivacy’s policy coding, there are more design initiatives that are focusing on short privacy notice design. An organisation offering services in Privacy Compliance and Risk Management Solutions called TrustArc,  is also in the process of designing an interactive icon-based privacy short notice. Most efforts have been done in simplifying the notices so as to decode the complex terminology. But, there have been very few evaluations and initiatives to improve the design of these notices. One of the existing suggestions on increasing usability of privacy notices are multilayered privacy notices. Multilayered privacy notices comprise a very short notice designed for use on portable digital devices where there is limited space, condensed notice that contains all the key factors in an easy to understand way, and a complete notice with all the legal requirements. Some of the examples above use this in the form of short notices and summaries. The very short notice layer consists of who is collecting the information, primary uses of information, and contact details of the organisation. Condensed notice layer covers scope or who does the notice apply to, personal information collected, uses and sharing, choices, specific legal requirements if any, and contact information. In order to maintain consistency, the sequence of topics in the condensed and the full notice must be same. Words and phrases should also be consistent in both layers. Although an effective way of simplifying information, multi-layered notices must be reconsidered along with the timing of notices. For instance, it could be more suitable to show very short notices at the time of collection or sharing of user data. 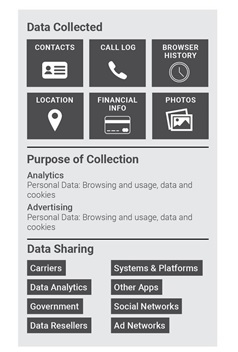 Based on their visual design, the currently available privacy notices can be broadly classified into 4 categories; (i) the text only notices which do not have a clearly visible structure, (ii) the text notices with a contents menu that helps in informing of the structure and in navigating, (iii) the notices with basic use of visual elements such as icons used only to identify sections or headings, (iv) multilayered notices or notices with short summary before giving out the full text. There is still a lack of visual aid in all these formats. The use of visuals in the form of infographics to depict data flows could be more helpful for the users both in short summaries and complete text of policy notices. 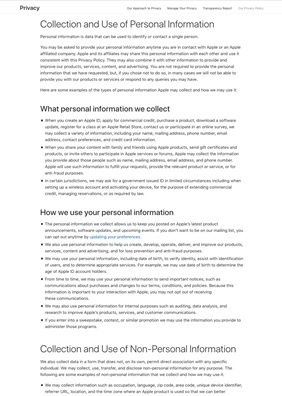 The design of privacy notices usually seems disconnected to the rest of the app or website. The UI/UX design of privacy notices requires as much attention as the consumer-facing interface of a system. The contribution of the designer has to be more than creating a clean layout for the text of the notice. The integration of privacy notices with the rest of the system is also related to the early involvement of the designer in the project. The designer needs to understand the information flows and data practices of a system in order to determine whether privacy notices are needed, who should be notified, and about what. This means that decisions such as selecting the categories to be represented in the short or condensed notice, the datasets within these categories, and the ways of representing them would all be part of the design process. The design interventions cannot be purely visual or UI/UX based. They need to be worked out keeping in mind the information architecture, content design, and research. By integrating the notices, strategic decisions on the timing and layering of content can be made as well, apart from the aesthetic decisions. Just as the aim of the front face of the interface in a system makes it easier for the user to avail the service, the policy notice should also help the user in understanding the consequences, by giving them clear notice of the unexpected collection or uses of their data. There is little guidance available to communication designers for the actual design of privacy notices which is specific to the requirements and characteristics of a system. The UI/UX practice needs to be expanded to include ethical ways of designing privacy notices online. The paper published by Florian Schaub, Rebecca Balebako, Adam L. Durity, and Lorrie Faith Cranor, called, ‘A Design Space for Effective Privacy Notice’ in 2015 offers a comprehensive design frame­work and standardised vocabulary for describing privacy notice options. The objective of the paper is to allow designers to use this framework and vocabulary in creating effective privacy notices. The design space suggested has four key dimensions, ‘timing’, ‘channel’, ‘modality’ and ‘control’. It also provides options for each of these dimensions. For example, ‘timing’ options are ‘at setup’, ‘just in time’, ‘context-dependent’, ‘periodic’, ‘persistent’, and ‘on demand’. The dimensions and options in the design space can be expanded to accommodate new systems and interaction methods. An ethical framework is required for design practitioners that can be followed at the level of both deciding the information flow and the experience design. With the prevalence of ‘dark patterns’, the visual design of notices is used to trick users into accepting it. Design ethics can play a huge role in countering such practices. Will Dayable, co-director at Squareweave,  a developer of web and mobile apps, suggests that UI/UX designers should “Design Like They’re (Users are) Drunk”. He asks designers to imagine the user to be in a hurry and still allow them access to all the information necessary for making a decision. He concludes that good privacy UX and UI is about actually trying to communicate with users rather than trying to slip one past them. In principle, an ethical design practice would respect the rights of the users and proactively design to facilitate informed consent. Based on the above recommendations, a guiding sample for multilayered privacy notices has been created. Each system would need its own structure and mechanisms for notices, which are integrated with its data practice, audiences, and medium, but this sample notice provides basic guidelines for creating effective and accessible privacy notices. The aesthetic decisions would also vary based on the interface design of a system. A fixed icon can appear along with all privacy notifications on the system, so that the users can immediately know that the notification is about a privacy concern. This icon should capture attention instantly and suggest a sense of caution. Besides its use as a call to attention, the icon can also lead to a side panel for privacy implications from all actions that the user takes. The very short notices can be shown when an action from the user would lead to data collection or sharing. The notice mechanism should be designed to provide notices at different times tailored to a user’s needs in that context. The styling and placement of the ‘Allow’ and ‘Don’t Allow’ buttons should not be biased towards the ‘Allow’ option. The text used in very short and condensed notice layers should be engaging yet honest in its communication. The summary or the condensed notice layer should allow the user to gauge at a glance, how the data policy is going to affect them. This can be combined with a menu that lists the topics covered in the full notice. The menu would double up as a navigation mechanism for users. It should be visible to users even as they scroll down to the full notice. The condensed notice can also be supported by an infographic depicting the flow of data in the system. The full notice can be made accessible by creating a clear information hierarchy in the text. The menu which is available on the side while scrolling down the text would facilitate navigation and familiarity with the structure of the notice. The presentation of privacy notices directly influences the decisions of users online and ineffective notices make users vulnerable to their data being misused. But currently, there is little conversation about privacy and data protection among designers. Design practice has to become sensitive to privacy and security requirements. Designers need to take the accountability of creating accessible notices which are beneficial to the users, rather than to the companies issuing them. They must prioritise the well-being of users over aesthetics and user experience even. The aesthetics of a platform must be directed at achieving transparency in the privacy notice by making it easily readable. Designers must engage in conversations with technologists and researchers, and include privacy and other user rights in design education in order to prepare practitioners for creating more valuable digital platforms. Saumyaa works as a designer and researcher. She creates visualisations and infographics to communicate research produced at CIS. She also works on critically examining the role of design in digital products and services, and in applying design for issues such as privacy, security, access to knowledge, and accessibility. She can be reached at saumyaa[at]cis-india[dot]org.